Renuka Camel Safaris have been operating and working with the same local desert tribal guides since 1988, making us the most experience operator in Jaisalmer. Our tribal guides love and extensive knowledge of the desert environment will ensure you have a fun, authentic and safe experience of a lifetime, in off the beaten track parts of the desert unknown to other tour operators. Before reaching the camel station on the edge of the desert, your tour will take you to natural a natural rain oasis where you will have the opportunity to take photos and freshen up in the small natural lake. Cold beers and soft drinks can be arranged, but please give us advance notice to ensure the is no disappointment! After this we will take you to an old fort with amazing view of old villages and landscapes, and if you a lucky you will get see wild Peacocks in the natural environment – a Truly Magical Experience. It's impossible to explain the magic of a Camel Safari. 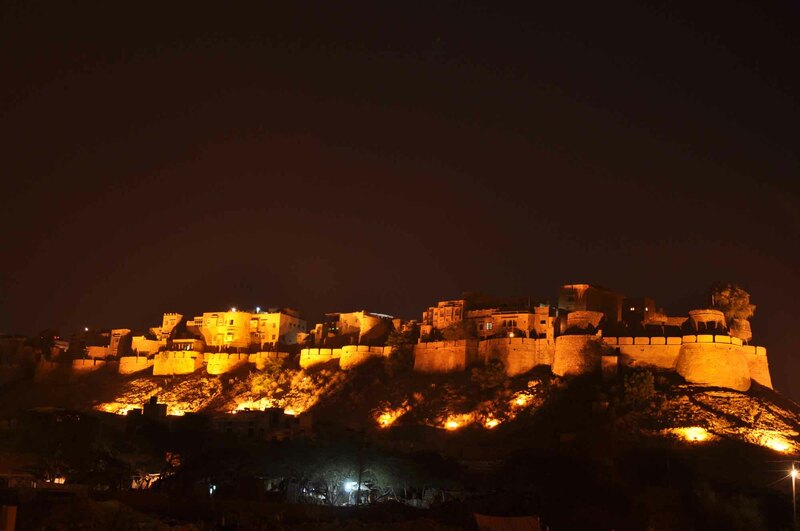 Almost everyone who comes to Jaisalmer wants to go on a camel safari, which offers the romantic experience of riding a camel, a visit to desert and if you wish, you can sleep in the open on the sand dunes under stars and moon. We have been organizing camel safaris since 1988 and seek out remote locations. We provide all the fringe amenities such as proper bedding and refreshment. Our staff would take great pleasure in showing you our special part of India in an environmentally friendly way. All safari's include all meals: dinner, breakfast, lunch, water and fruit. Each person will have his/her own camel. You will be taken by jeep (about 1 hour’s drive) to meet your camel and the drivers and will return to the hotel by jeep. You will sleep under the stars - blankets and mattresses are provided. We offer free, secure luggage facilities in the hotel whilst you are on safari. Ideally located at a convenient distance of 2 Kms. from the railway station, walking distance from the bus stand and a few minutes walk from the fort and the old city. Pick-up can be arrenged from Jodhpur, Jaipur, Udaipur and Bikaner upon request. Renuka Camel Safari - Travel Smart, Travel Fun, Travel Safe! 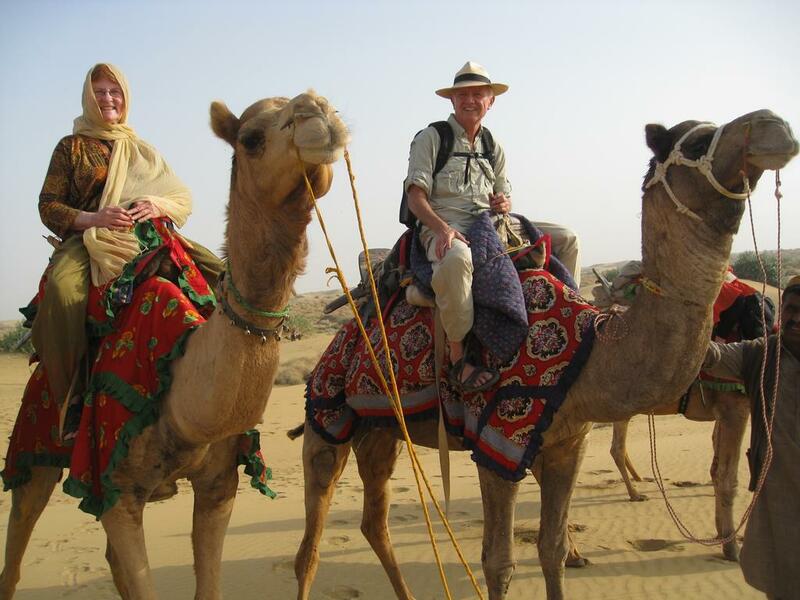 Renuka Camel Safaris have numerous tour package options, as found below. Unlike other tour operators, we have been working with the same experienced, tribal guides since 1988, own our own base camp and little piece of desert paradise. Therefore, we can easily accommodate any special requests or wishes our customers may have. As well as the many predefined package tours you will find on our website, unlike other operators, we can even offer our customers the option of sitting down with us, and creating tours tailor made to your specific requirements and wishes. By doing so, we ensure you get exactly what you want, how you want it. We can guarantee you a magical and unforgettable desert camel safari of a lifetime! And for all the above reasons, our reputation proceeds us! Please do not hesitate to contact with any request. Me and my parents did a camel zafari for one and a half day and it was one of the most magic experiences we have had in India. First of all, organization was perfect, especially coming from the hotel administrator Sunny. We arrived on a bus from Jaipur one hour late, and the administrator's son was waiting for us there ready with a jeep to take us to the hotel. Fantastic experience! We did a simple two day, one night safari and it was perfect! Del-Boy, our guide, was an absolute hero! He cooked us amazingly complex food on a fire built by us and even let us help him make chapattis (with mixed results!). He was really good fun and even sang us to sleep! I recommend the camel safaris of Hotel Renuka. Our camelguide Pirkas and his friends were awesome and we had a really good time together singing around a small fire. Of course a desert is not only sand dunes and there are quite lot of wind mills. But i prefer them over nuclear centrals or else. 1. We arrange Taxi, Cabs and Package Tour through out India with proffesional drivers having good knowledge. 2. We do pick up and drop by Cabs from anywhere within Rajasthan. Please Click On contact us for more information about our tours and community programs.